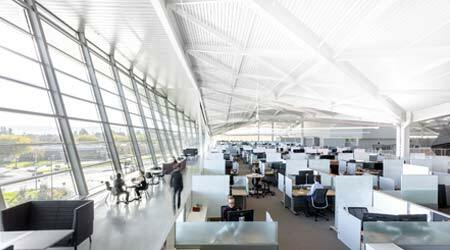 LEED awards efficient lighting, lighting quality, and daylighting strategies. Here is what you need to know. Lighting affects energy efficiency both directly and indirectly. Lighting power density, which can be improved through the selection of efficient light sources and fixtures, contributes directly to improved efficiency in connected power. However, the use of lighting controls — dimming or turning lights off when they are not needed — is now the most effective way to reduce energy use. Indirectly, electric lighting also contributes to air conditioning loads; the change to LEDs has reduced the heat gain from the lighting, but there is still an impact. And the successful integration of useful daylight can further reduce electricity use for lighting, without increasing the cooling loads so far as to negate potential savings. The LEED rating system addresses these direct and indirect impacts of electric lighting on energy efficiency. Lighting is incorporated into building energy models so that its direct impact (electric use) and indirect impact (increased cooling loads) are accounted for. There are points available for the incorporation of lighting controls and successful daylighting, both of which promote further ratcheting down of lighting energy use. The incorporation of daylighting into the LEED rating system is very thorough — encouraging the delivery of good quality daylighting by avoiding glare and overlighting (quantified using the Annual Sun Exposure metric). The LEED rating system also puts an emphasis on access to daylight throughout a space, examining the ability of controlled daylighting to offset electric lighting energy use (quantified using the Spatial Daylight Autonomy metric). LEED also now offers a credit focused on lighting quality, which includes an examination of the lighting environment created. There is also a focus on providing views to the exterior — numerous studies have demonstrated the value of an exterior view to improve occupant satisfaction, reduce medication needs and bed turnover times in hospital settings, and reduce stress. The inclusion of credits for views and lighting quality were perhaps a bit of foresight into the shifting attitude of the building design, construction, and operations community.